Heavyweight contender Travis Kauffman, is set for a home town showdown, against Manuel Quezado, for the vacant World Boxing Union Inter-Continental Heavyweight crown, onthe Marshall Kauffman King’s Boxing promoted ‘GET READING TO RUMBLE’ mega event at the Santander Arena, Reading, PA, on Saturday 30th November 2013. 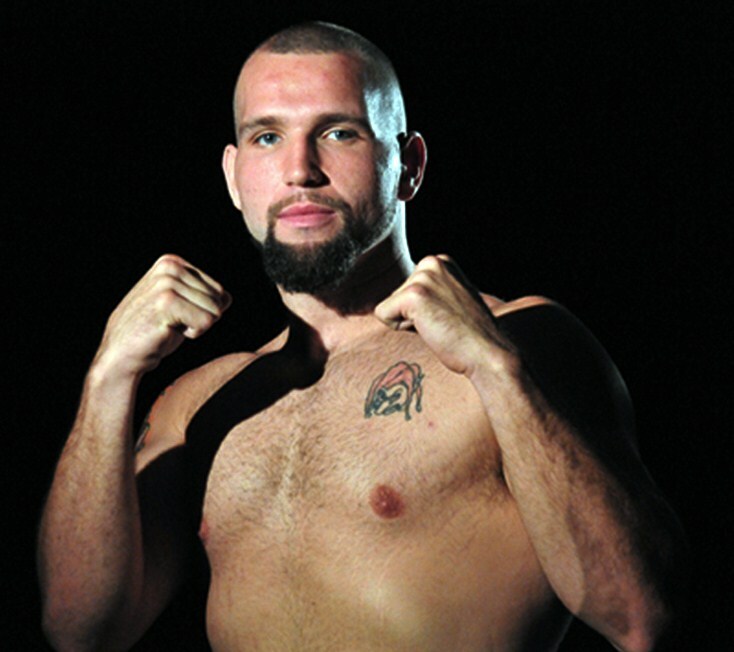 Since turning pro in 2006 Travis (pictured/Kings Boxing) has racked up an enviable twenty six wins, nineteen by stoppage finish, and just the single loss, against Tony Grano in September ’09. Even though this isn’t his first tilt at a Championship - having secured the WBF Inter-Continental title in May 2010, with a sensational second round stoppage of Youngstown, Ohio’s Chris Koval - Travis is so determined to secure the coveted WBU crown, that for the first time in his career he has recruited a new member to his training team, former World Cruiserweight Champion Al Cole. Travis clearly feels that the introduction of the former World Champ is the ace up his sleeve, that will ensure his success on November 30th, as he made clear when he spoke earlier. “I don’t underestimate him at all, he may not have boxed for a while but he’s been fighting in MMA, so he is fight ready. He’s had more championship experience than me, but I have a lot of experience in the amateurs andI’ve had a lot of professional experience as well. I’ve been extremely busy, this is my fourth fight in less than a year, I’ve dedicated myself in camp and there’ll be a new Travis Kauffman on the 30th, which I don’t think anybody has ever seen. I’ve been sparring Tomasz Adamek, he’s been helping me for November 30th and I helped him for his November 16th fight. I don’t think you can get better sparring than I’ve had for this fight, I’ve also sparred Brian Jennings and we’ll be brought him back into the camp, I’ve also been sparring Monte Barrett, so you can see I’ve been sparring World class fighters. To prepare me for my fight, besides my father Marshall Kauffman, Al Cole a former Cruiserweight Champ of the World,he’s helping train me. I don’t like to have a whole bunch of people around me, I’m not someone who has an entourage of trainers and the like. I’m really up for it, I’m training really hard, I’m really enjoying my boxing and I think everything’s going in the right direction. 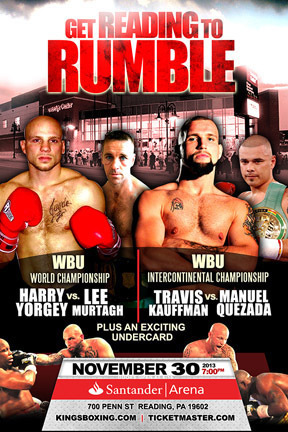 Travis Kauffman versus Manuel Quezada, for the WBU Inter-Continental Heavyweight title, takes place on the Marshall Kauffman King’s Boxing promoted GET READING TO RUMBLE event at the Santander Arena in Reading, PA on Saturday 3oth November 2013. Tickets, priced $100, $75, $50 and $35. Tables of 8 cost $750 and be purchased at www.ticketmaster.com or call 610 587-5950. Kings Boxing would like to thank: Reading Eagle, GMI First, Empire Surplus, Ran’s Flooring, and Dino’s Wings & Things. Please go online to www.wbuboxing.org or www.wbueurope.eu for additional information on upcoming WBU and WBU Europe sanctioned title fights.